And so, the next phase of this series - centering around the works of Alan Moore - begins with what could well be the most heavyweight of his adapted works, indeed, the archetypal Graphic Novel™. First released over twelve issues in 1986(/7) and set in an alternate 1985, Watchmen begins as a slightly offbeat murder mystery in a world where costumed heroes fought crime alongside the police, but have since been outlawed. The book's first page opens with three horizontal panels; a receding aerial view of the smiley badge once belonging to former Watchman and all-round a-hole The Comedian, lying in a gutter awash with blood. The sequence is narrated by the detective-vigilante Rorschach's journal and sets the tone of the book perfectly; rigid in its layout, nihilistic in its content, visceral in its meaning. This is topped later only by scientist-turned-demigod Dr Manhattan explaining that the difference between life and death is, to him, barely even worth mentioning. This is only the third time I've finished the book, yet I still struggle to write anything approaching a 'review', probably not least because it's way more complex than the novels I do manage to read when I'm not sitting in a cinema or writing about sitting in a cinema. The first time I read it (before the Zack Snyder's film-version was released), I freely admit to being pretty much lost for the first four issues or so, although never to the point where I wanted to stop. As well as the more straightforward flashback sequences as we go along here, tangent threads drift in and out of the main narrative, coalescing as the story evolves from all directions. Additionally, the last 3-4 pages of each issue present passages from in-universe books and magazines, giving the reader even more background to the characters and surrounding events. 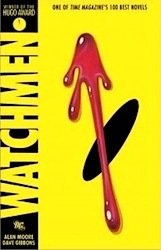 And not to get too hung up on the difference between a comic, a trade-paperback, a novel and a graphic novel, but Watchmen can be classed as A Novel on the sheer density of the text alone. And the aforementioned panel-structure means there are no placeholder or filler-pages. Every single line of every single frame matters, even though it may not seem to the first time round. This is a book which rewards re-reading. It also rewards patience; do not think 'oh, it's only twelve comics, I'll be able to zip through that in no time'. Ah, the DC ensemble hero-movie it's still cool to like ;) Joking aside, this film is the reason I can't give up on Zack Snyder, no matter how unsure his footing becomes these days. 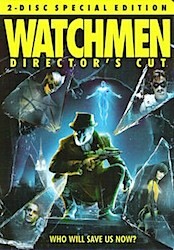 And oddly, Watchmen was one of the first movies I reviewed here, back in the day. Landing in our cinemas in 2009, Watchmen hardly ushered in the 'dark superhero' movie, but it's arguable that films like 2005's Batman Begins paved the audience's way for a story like Watchmen to be told properly. The fact that the tale itself predates the cinematic trend for scowling heroes works even more in its favour. And speaking of timelines, in the alternate 1985 we see here, there are shades of the 'Bad Hill Valley' from Back To The Future Part II (and also in some of the ageing prosthetics, if I'm being fair). And while that film arrived with us three full years after the publication of Watchmen, it's worth noting that the cinematic version arrived twenty years after that. I like to think there's a bit of circular-influence going on, theatrically at least. Of course there are differences between the storytelling techniques you can employ on the page and the ones which will work on-screen. The film can't dot around its own timeline in quite the same way, so most of the background world-building is taken care of with a montage behind the opening titles. Screenwriters David Hayter and Alex Tse capture the episodic feel of the story's published forbear, and while it's not as minutely-complex as the book, the plot itself it still largely intact. Although as my director's cut is just over three hours and still skips through some of the intricacy and nuance, it's hard to imagine what more it could have done, realistically. This isn't a panel-for-panel transcription of the original source-material, but it's as close as we were ever going to get*1, and hats off to Snyder for making that happen. 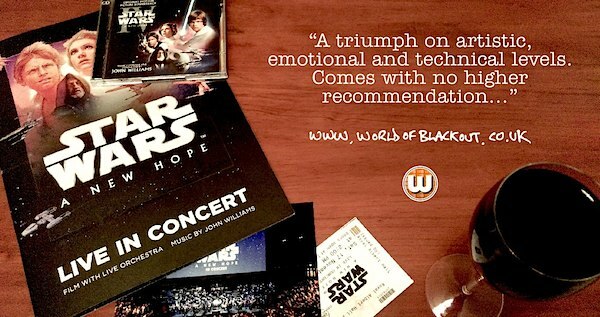 Visually, tonally, emotionally, this is an outstanding adaptation. 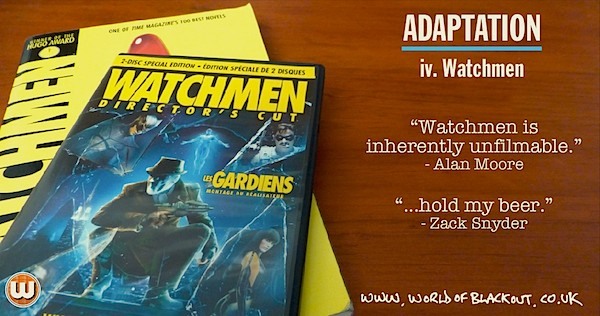 "Watchmen is inherently un-filmable" - Alan Moore. "…hold my beer." - Zack Snyder. For my money, very, very much so. Not that I heard. This time. Although there is a very similar one when someone gets thrown over the railings in the prison-riot sequence. Level 2: Well, Matthew Goode's in this (may god have mercy on his accent), and he was in that Stoker along with Ralph 'Ric Olié' Brown.